This fabulous collection of cars was brought together by two French brothers, Hans & Fritz Schlumpf, and consists of hundreds of the most beautiful cars ever produced. The "Schlumpf affair" is perhaps one of the most famous stories in the car collector's world, covered extensively by the media in the mid-1970s when the collection was seized by the trade unions and, later, by the French government. 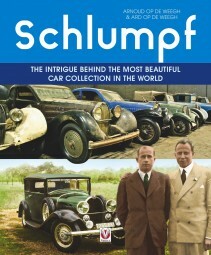 The Schlumpf brothers were accused of fraudulent actions to obtain their collection - but following extensive research by the authors of this book, the true story behind the collection is revealed. Ard and Arnoud op de Weegh spent many years investigating the Schlumpf affair, and discovered many previously unpublished documents which prove that the Schlumpf brothers have been wrongly accused over the years. This book is written to tell the true story behind the collection, and also to rehabilitate the Schlumpf family.